First wave. Crashed on outward flight. Richard Bolitho was born on 19 January 1920 in Derry city, in Ireland*. His father William Bolitho was a commercial traveller in the seed business, originally from Cornwall. He had stayed on in Ireland after meeting and marrying a local woman, Jane Cuthbertson, the daughter of a land steward. Richard was an only child. In 1927 the family moved to England where they bought a hotel in Kimberley, Nottinghamshire. Richard moved in with his aunt Emily who owned a fruit and vegetable shop in the town. He was educated at the local Church Hill School and then won a scholarship to the nearby Heanor Secondary School (later Heanor Grammar School) in 1931. He joined the RAF in 1940, but wasn’t selected for aircrew training until early in 1942. After qualifying as an air gunner, he was posted to an operational training unit, where he crewed up with Max Stephenson, Floyd Wile, Don Hopkinson and Albert Garshowitz. 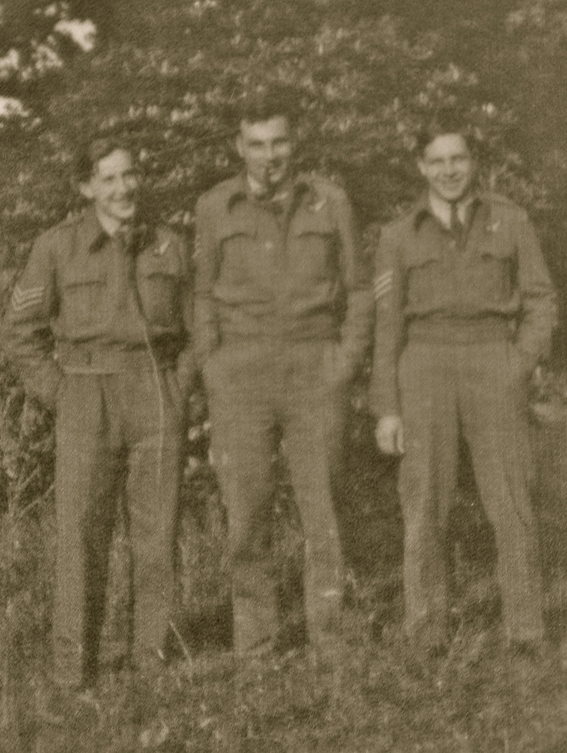 The five were then selected for heavy bomber training and John Kinnear and Frank Garbas were added to the crew. Their first posting to 9 Squadron was cut short when Stephenson was killed while flying with another crew, and the remaining six were sent on to 57 Squadron at Scampton, and assigned to Bill Astell. They first flew together on 13 February 1942, but some six weeks later they were all posted to the new 617 Squadron. His last leave before the Dams Raid was spent at his home in Kimberley, where he was accompanied by his colleagues Floyd Wile, John Kinnear and Albert Garshowitz. All would die together near Marbeck in Germany just a few days later, in the early hours of Monday 17 May 1943, and they lie together in Reichswald Forest War Cemetery, having been reinterred after the war from their original graves in Borken. In 1946, three years after his death, his parents returned to Northern Ireland where they lived in the coastal resort of Portrush, and they lived out their days there. * Bolitho’s birth predates the partition of Ireland in 1921 into Northern Ireland and the Irish Free State. The information above has been taken from the books and online sources listed and other online material. Apologies for any errors or omissions. Please add any corrections or links to further information in the comments section below.